A recession could be looming for the U.S. economy. 2019 could go down in the books as the year the U.S. economy slowed down and faced severe headwinds. To predict a recession, there are a few things economists generally look at. For example, they look at business sentiment and business activities. If businesses are producing, it means they are expecting demand to increase, and economic growth could be ahead. Right now, businesses in the U.S. economy aren’t that optimistic. This indicates that a slowdown could be ahead. Look at the chart below. It plots the year-over-year change in total business inventories in the U.S. Right after the previous recession, businesses in the U.S. started to pile up inventory. Since early 2011, we have continued to see their rate of inventory growth take a hit. Inventories edged up slightly in 2017. But, since early 2018, the rate of growth has been stagnant. At its core, this says businesses could be preparing for a recession. Look at another chart. It plots the year-over-year change in construction spending in the U.S. economy. When there’s a lot of construction spending, it’s a sign of optimism and growth. If it stalls, it’s worrisome. 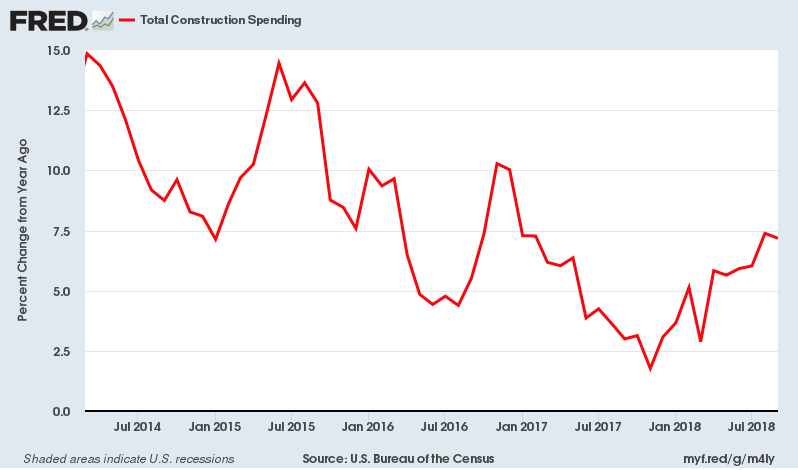 The construction spending growth rate in the U.S. economy has stalled significantly. In early 2015, it was growing at around 15%. Now, it is below 7.5%. This represents a 50% deceleration in the growth rate. Not good at all. Yield Curve Paints a Dire Economic Outlook for the U.S. Beyond business inventories and construction spending, look at the yield curve as well. This is hands down one of the most widely used recession indicators by economists. What is the yield curve? It’s essentially a chart that plots the difference between the long-term bond yield and the short-term bond yield. What does it tell us? When the difference in the yield of long-term and short-term bonds reaches zero and drops into negative territory, it’s one of the surest signs that a recession is here or could be nearing. With that said, look at the chart below. It plots the difference between 10-year and two-year U.S. bonds. Dear reader, understand that interest rates are going higher. Higher rates cool down an economy. As we move forward, in light of higher interest rates, a recession could become reality for the U.S. economy sooner than later. Right now, there’s still a lot of hope and optimism out there among investors that things will eventually turn around and that higher interest rates won’t do much. As I see it, this is very dangerous rhetoric. I stand in the camp that believes the Federal Reserve raising rates will lead to a recession in the U.S. When the data starts to show this, we could see a lot of panic across the board in various assets. Obviously, with time, we will know more. But 2019 doesn’t look like a great year for the U.S. economy right now.